There’s nothing like a nine-patch. These quilt patterns are incredibly easy, beautiful, and — best of all — perfect for quick quilting and scrap usage! These types of easy quilt tutorials are always a reader favorite on FaveQuilts, whether it’s full nine patch quilt patterns or nine patch quilt block patterns. So we’ve stocked up, just in time for you to use up the last of those winter fabric scraps and clear out your stash for spring! The best thing about a nine patch quilt is that every single one is unique. 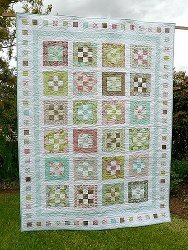 The Colleena Baby Quilt and the Groves of Gardens Nine Patch are based off the same technique, but have totally different aesthetics. Choose your favorite! Disappearing nine patch quilt patterns are some of my favorites. These patterns have such a fun, energetic look to them — perfect for baby quilts or living room throws! 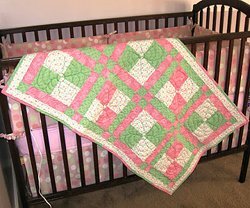 Make the adorable Springtime Disappearing Nine Patch Baby Quilt for your next baby shower or for your own little ones. 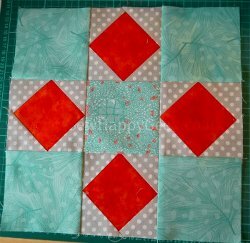 Want a little more freedom than a full quilt tutorial can give you? Try one of these nine patch quilt block patterns, which will teach you how to make a single block that you can put to use however you choose — table runners, kitchen decor, a bed-size quilt … you name it! Don’t miss our awesome giveaway from Leilani Arts! And don’t miss out on our current giveaway! Ready your stash for spring with the Leilani Arts Colorful Silk Sari Ribbon! Each skein of Sari Ribbon is totally unique. These beautiful fabric bundles are remnants of gorgeous, vibrant silk saris made in India and sewn together by a women’s cooperative for resale. Each skein contains approximately 75 yards of silk, so you will be able to put even just one of these bundles to good use. Enter today! We are giving away one skein from Leilani Arts. The deadline to enter is March 25th at 11:59:59 p.m. Eastern Time.